I got Neo at 6 weeks, and he weighed 13 lbs at 8 weeks. He is a very active pup. Took him for another set of puppy shots today, and he weighs 24 lbs at 12 weeks. Ears are straight up already, but he has a few floppy days. I think he is pretty much on schedule. I feed him Blue Wilderness large breed puppy. Pics are at 6, 8, and 11 weeks. Sounds like he is maturing just fine and the food that you have him on, Blue Wilderness large breed puppy, is a very good food. 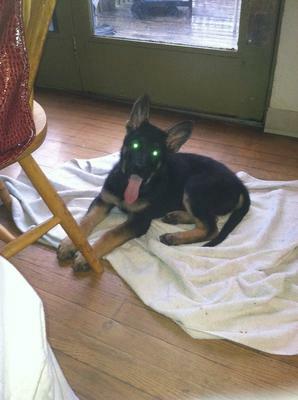 So good for you - that will definitely help him as he matures into a big, handsome German Shepherd Dog. And don't worry about rushing him since he has a long time to mature yet. 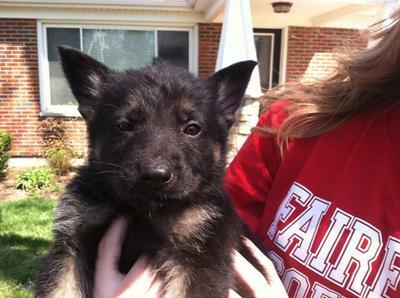 Typically, German Shepherd males don't reach their full size until they are about 3 years old. So he may eventually look skinny for a while but don't worry, as long as he is happy and playful he should be all right. Once he gets closer to 3 he will really start growing into his adult sized and much larger frame. I wanted to take a second to thank you for taking the time sending in the wonderful pictures of Neo - I'm a big Matrix fan too! :) Maybe in the future you can send us in an update on how he's doing and how he has matured. I wish you nothing but good luck and lots of success with him. 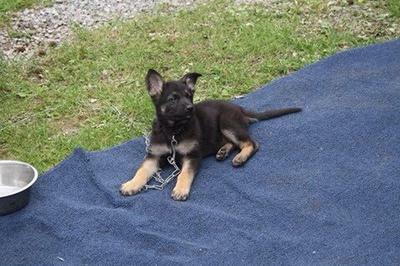 Get him into a puppy class as quickly as you can and start training that baby Einstein you have there living with you because GSDs are super duper smart and the more you train him the better off for all of you. Your baby is Adorable!!! Love the puppy year and enjoy cause next year he will so big. German Shepherds are an Amazing breed, so Protective, Loyal, Trustworthy but most importantly, LOVING!!! Take care of your boy, Neo and he will take care of you! I am really trying to be patient....Our last GSD (Sheba) was 135 lbs! I don't think Neo is going to be that large, but we love big dogs who are big babies with us...and BIG DOGS with those who would intrude, or attempt to do harm.